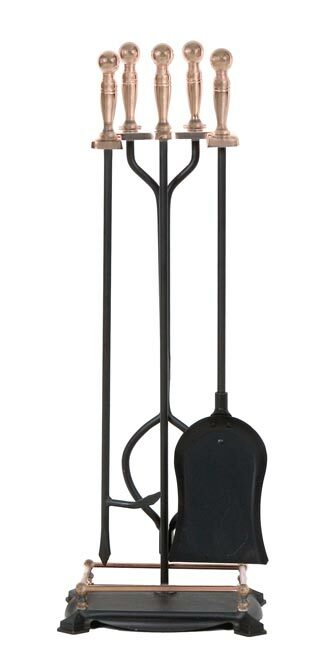 Add traditional style to your fireplace with the Panacea Five Piece Fireplace Tool Set with Antique Brass Handles. The brass and black hues, metal body, and classic shape bring a timeless look to your hearth, and the set includes a wealth of tools to safely stoke your fire. A rectangular, metal base with four extended feet keep this item stable on a level surface, and an elevated, aged brass colored rod surrounds it for added style. A 28" long, round rod extends upward from this platform, and a metal yoke at the top of this rod accommodates the included tools. The tongs allow you to add logs to the fire as needed, while the poker makes repositioning them simple. Use the included broom and shovel to remove old ash once the flames are extinguished. The black shaft of each tool adds a timeless appeal to the set, and rounded, antique brass colored handles complete each unit. The metal construction throughout the item lasts for many seasons, for faithful use over and over again. Tend to your fire in elegant style using this Five Piece Fireplace Tool Set with Antique Brass Handles. Some assembly required.